To get a genuine OtterBox Defender for iPhone 6 Plus Amazon be sure your item is both “sold by” and “ships from” Amazon. You can buy the correct, genuine part here: http://amzn.to/2mdizAa. Are there fake or counterfeit OtterBox Defender cases on Amazon? Yes, absolutely. It is sort of a scam. Cheap, Chinese imitation items have been around for years. Now they have made their way online onto sites like Amazon. sometimes when people are buying something on Amazon they don’t realize who the seller is. Not all items sold on Amazon are sold BY Amazon. Amazon is working on the problem but it still exists. CNBC covered it here, and OtterBox has a page dedicated to stopping counterfeits here. Amazon is also working on it, and you can read their anti-counterfeiting policy. Does the OtterBox protect the iPhone 6 Plus? We repair cell phones here all the time and the OtterBox absolutely protects phones. In fact, if you do not buy one you will likely need our cell phone repair service. 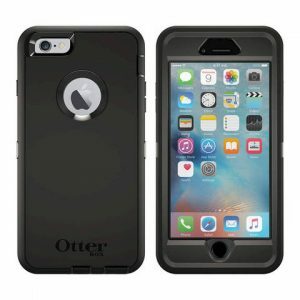 How can I tell if it is a genuine OtterBox or a scam? Again, use the link to go directly to Amazon and buy the Genuine with free Prime Shipping.